In 1949, Margaret Norquay moved with her new husband, a minister with the United Church of Canada, to Mayerthorpe, in northern Alberta, a village in the centre of what was in those days a pioneer hinterland. 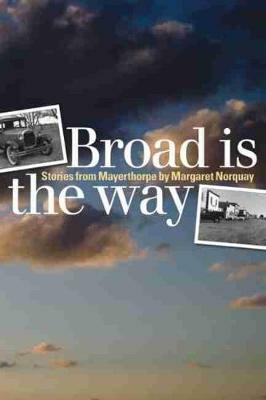 Broad Is the Way is a collection of stories from their seven years there. Told with affection and gentle humour, the stories cover the challenges, heartaches, and delights of a young community and a minister and his wife in a very new marriage. Topics include the experience of orphan children sent to work on Western farms, manoeuvring for a restroom downtown for farmers' wives in need of a place to change their babies while their husbands did business, dealing with the RCMP over liquor found in the church basement, and the generosity of spirit shown by the community to the Norquays. Throughout the book, Margaret Norquay's indomitable spirit and determination are evident and illustrate her passionate belief in making positive change and having fun while doing it.